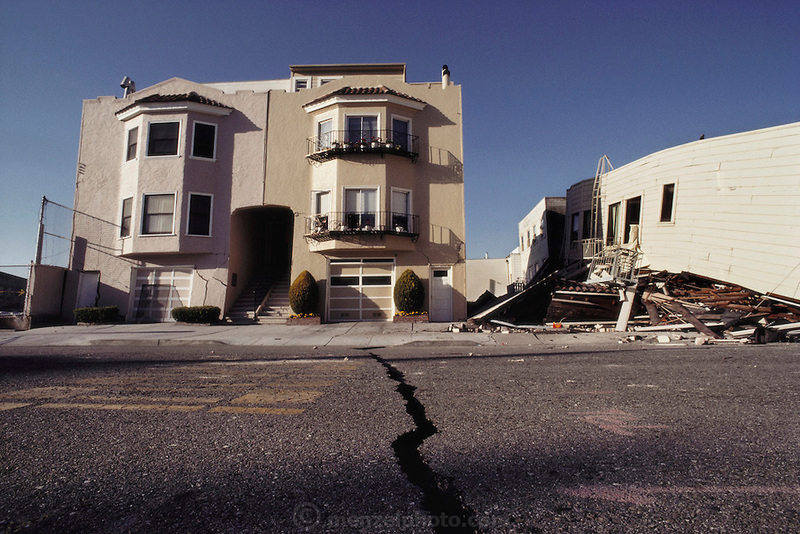 Aftermath of the October 17, 1989 Loma Prieta Earthquake, San Francisco, California. Damage in the Marina District of San Francisco resulting from the earthquake that occurred at 5:04 PM and lasted 15 seconds. At a magnitude of 7.1, it was the worst earthquake in the San Francisco Bay Area since 1906. The earthquake left parts of San Francisco without power for four days; at least 27 fires broke out across the city, a four-foot tsunami wave traveled from Santa Cruz (which also suffered considerable damage to its downtown structures) to Monterey, and in Oakland parts of the Cypress Structure freeway collapsed onto each other.